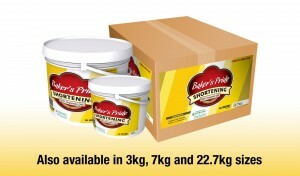 Baker’s Pride Shortening is widely used by many bakeries in Trinidad and many of the pastries, cakes and delicacies that you consume today are actually made with Baker’s Pride. 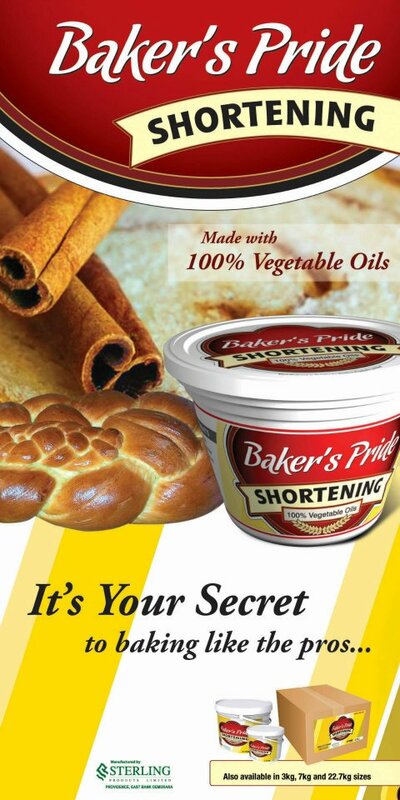 Baker’s Pride Shortening is made from 100% Vegetable Oils, and shelf stable and requires no refrigeration. Available in a convenient, re-sealable 300g retail tub. Also available in convenient, attractively branded, reusable and resealable 3kg and 7kg buckets with UPC bar codes for the retail, foodservice and club-store channels. A 20kg carton is also available for the foodservice channel. Bake like the pros……. use Baker’s Pride.